Manila, Philippines – The MEGA Young Designers Competition will finally face the fashion council to show their fearless fashion forecast. The remaining sixteen designers were tasked to create an outfit that will showcase their forecast on global fashion for the coming 2012. They were sent to the historic Rizal Park to gather inspirations and to remind them that they are talented pinoy artists worthy to be in the international fashion scene. The sixteen designers were formed into three groups that had to race back to SOFA after buying their fabrics. The last team to arrive will receive a punishment as one design tool will be taken away from the team. Robin Gundran’s team got to SOFA later than the other two teams and had to give-up their scissors for the challenge. Five hundred pesos was also deducted from their budget. The designers also need to know by heart the standard model size. As a final twist, the models for this challenge will not be sent for the fitting and will only wear the final pieces. Fashion mentor Angela Alarcon went through all the designer’s concepts, fabrics and design, carefully checking if the contestants were aligned with the challenge’s theme. Watch as the remaining sixteen designers finally showcase their global fashion forecast to the fashion council. Will the visions of the designers be refreshingly new? Or, will the designs fail to set trends at all? This time around, three designers will not make the final cut! Find out by watching MEGA Young Designers Competition 2012 every Saturday, 7 pm on ETC, with replays every Sunday at 10 am. Generation MEGA Season 3: The MEGA Young Designers Competition 2012 was created for TV by the MEGA Publishing Group. 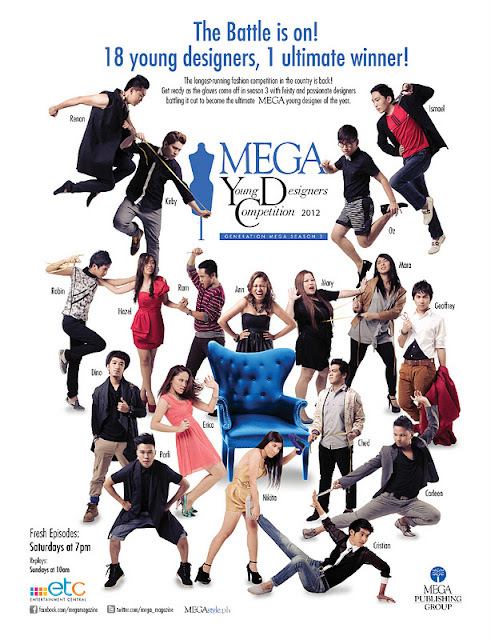 For more information on the MEGA Young Designers Competition 2012, visit www.megastyle.ph. Like us on Facebook and follow us on Twitter for more updates. wow, your blog is amazing! you're so pretty, and love your poses. i enjoyed your style... you have an amazing figure. :) new follower. hoping to stay connected. cheers from usa!